Hypnotherapy employs a range of skilled verbal communication, used in Psychotherapy. It is intended to uncover psychological resources within one’s unconscious mind and bringing them forth to the conscious ability. Hypnotherapists direct the clients’ cognitive focus and imagination in such a way as to bring about intended alterations in sensations, perceptions, feelings, thoughts and behaviour. Hypnotherapy interventions can be applied to a wide range of clinical usage such as medical, dental and psychological treatments. Areas of application include anxiety and stress conditions, weight control, addictive behaviours (including smoking, alcohol and substance misuse) and confidence issues. Hypnotherapy is also used to enhance performance in several areas such as sport performance and public speaking. 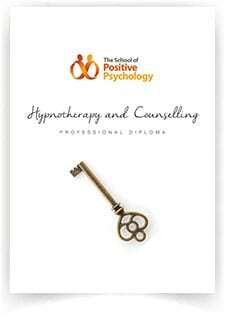 The Diploma in Hypnotherapy and Counselling is developed by The School of Positive Psychology and its graduates are eligible for a professional membership for practice with the National Council of Psychotherapists, U.K. This course aims to provide a comprehensive understanding of hypnotherapy and counselling practice in the area of psychotherapy. This course is intended for working professionals in the psychological outreach services or inspirational personnel who wish to obtain professional training to enter the field.